A smart and often comedic film about a man who has lost his way in a changing industry and is uncertain of what he wants out of life. 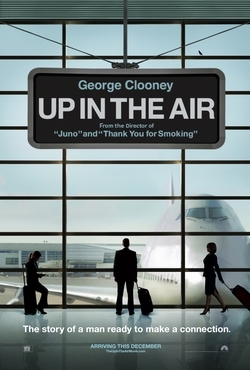 Up In The Air is a pretty creative and even somewhat deep george clooney film that sort of defies categories. It’s not a comedy, but it has some elements that are slightly funny. It’s not a drama, but it does have some touching moments and that are even kind of powerful. But overall, It’s just interesting and different. Starting with the essential premise, that this guy, ryan bingham fires people for a living. He is sent out to different companies to fire the employees face to face because the bosses of these companies don’t want to do it for themselves. The movie opens with Ryan’s voice over as we watch him moving through the airport talking about his strategies for going through security and moving through lines and how he feels so at home here, He feels like he’s away when he’s at his apartment, but at the airport, he feels like he’s where he belongs. We watch Ryan fire zach galifanakus and then meet alex (vera farmiga) in a hotel bar and he hits it off with her. The two of them are two of a kind with all the same ideas about car rentals and platinum cards. They discuss the weight and material of different cards as if they were in that scene from american psycho, passing around business cards and talking about them in great detail, And they start up a little fling that goes back to the hotel room. Ryan then returns to his home office, in omaha nebraska to learn from his boss, jason bateman, that the company is changing. There’s a new approach being pedaled around to fire people over the internet, by using a computer monitor. This will save on expenses of flying their employees around the country, from place to place. Only ryan feels it’s impersonal and even disrespectful. A large portion of the movie is devoted to ryan and natalie (the girl who’s idea this whole internet firing thing was) flying around the country and firing people in all different cities. It’s extremely creative of the screenwriter to have ryan spend so much time with the character who is perceived as his enemy, the one who is really pushing this whole thing that will completely destroy the way of life he loves. The other major plot line of the movie involves ryan’s perception on romance and attachments. He gives a motivational speech over and over again, in all different cities, about an imaginary back pack filled with all the things in ones life. The idea is that the back pack gets really heavy with all the things you pack into it, and that if you can find a way to cut some of them loose, it will feel much lighter. That’s ryan’s way of life. He has an apartment in omaha that he stays at for only about twenty days a year. And things are changing all around him, not only with his job. when he tries to reconnect with a neighbor that he used to have casual affairs with, she tells him that she’s met someone. Everyone’s moving on but him. But he’s got alex. She seems pretty great, and they keep finding times when they will be in the same city, to meet up with each other. they crash hotel parties and sit down with natalie for talks about life and love. As the movie goes on, Ryan starts to have a change of heart about his life decisions. Is this really what he wants? There’s a fantastic little break from the movie where ryan goes to his sister’s wedding and spends some time with alex in the hometown where he grew up. Aside from having that garden state feel of visiting places from childhood (complete with the same kind of music and everything, as that movie had), there’s also the wedding itself and a scene where ryan has to give a pep talk to jim (danny Mcbride), the man who will be marrying his sister. This scene is another very creative touch by the writers because ryan is basically called in to deliver a speech that preaches the exact opposite of what he believes in. it’s the opposite of his back pack speech, and he even points that out to his sister, but as he gives it, he starts to realize that maybe there’s actually some truth to it. The movie might feel like it’s all moving in one predictable direction and like it’s just more of the same for a while, going to different cities and firing people. But change is coming. Even when it seems obvious that ryan is starting to learn and realize things that he never thought before, the ending still remains unpredictable. The movie does contain a circular ending, and the character does change and develop during the course of the film, but what happens to him is not the simple, happy ending that one might usually find in a movie like this. Up In The Air works because it has something new to offer. Like his character in michael clayton, with this unique job that bingham specializes in, he has created a sort of niche for himself. and the movie really examines that job and the reasons why bingham is so good at it. There’s a fantastic scene with jk simmons where ryan manages to convince the man that this is his chance to suddenly do what he has always wanted to do with his life. It’s an interesting film, with a background story about trying to reach a certain number of sky miles and make that an accomplishment. And yet by the time he does it, bingham barely even notices. there are just too many distractions on his plate. This is not a great movie, only because it is a little repetitive in the second portion of the film, with more and more companies being visited and downsized. But what an ending. And what a great initial premise. Clooney handles the material really well, and for jason reitman (Thank you for smoking, juno), it is absolutely his best film yet.